If you’re a consultant working solo or with a couple of colleagues, your resources are spread thin. The demands of running a successful practice – from marketing and accounting to client cultivation and staying abreast of sector trends – can be overwhelming. You need a group of colleagues to talk through the ins and outs of your profession. Join us. ACN is comprised of a core of dedicated practitioners with deep expertise across the nonprofit sector. 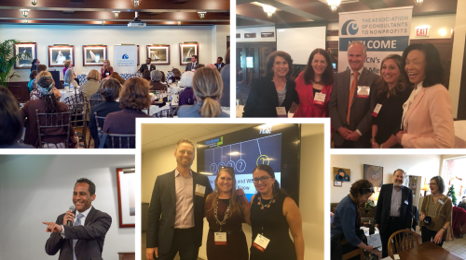 Led by a Board of fellow consultants, we are dedicated to the professional growth of our members as leaders and business owners within the nonprofit consulting arena. Professional Advancement. Members have complimentary access to four professional development programs per year. We design these quarterly events to promote both educational and networking opportunities. With our diverse programming and dedicated time to develop relationships with fellow consultants, your networking just got a little easier. A Far-Reaching Peer Network. Your professional connections are your lifeblood, but this crucial work often falls to the bottom of the to-do list. We can help you with that. Indeed, 84% of ACN members report that they joined ACN to network with other consultants. Your practice is stronger for having a network of colleagues that you can turn to on projects where multiple kinds of expertise is required. ACN dashboards - real-time dashboards that the ACN Board of Directors uses to look at the "Big Picture of how the organization is doing. Visibility. Individual and organizational members develop profiles dedicated to their consulting practice on the ACN website, which attracts approximately 1,200 unique visitors per month. Real-Time Access to New Projects. We notify members every time a nonprofit organization submits a new RFP or RFI through our channels.